Although your teeth are made to last a lifetime, that does not always happen. Roughly 35 million Americans do not have any remaining natural teeth. If you are among those missing all the teeth on the top or bottom arch, you need an effective solution to replace your teeth. While you could choose a traditional option, like dentures, they will never really look or function like natural teeth. Not to mention, they can be inconvenient and uncomfortable. Now, you can choose the most preferred tooth replacement option with implant retained dentures. As a dentist for dental implants in Cambridge, Dr. Lee will restore your smile and oral health with a lifelong solution. Implant retained dentures have quickly become the patient-preferred choice for tooth replacement because they provide a permanent solution. An arch of custom-made teeth is created, which are anchored in place using an average of 4 dental implant posts. The implant posts are surgically inserted into the jawbone, allowing you to gain added benefits that are not possible with other replacement options. What are the Benefits of Implant Retained Dentures? The use of the implant posts allows the dentures to closely mimic the function and appearance of natural teeth. In fact, you will gain an increased biting force of over 70% when compared to traditional dentures. The use of the posts allows the replacement teeth to stay firmly anchored in place. There is no irritation, slipping, or discomfort. They are a secure and convenient option that will last a lifetime. In addition, the implant posts also stimulate the jawbone, allowing you to preserve bone density. This stops facial sagging and the loss of facial structures. With the jawbone fused to the posts, you enhance your oral health by preserving your bone. 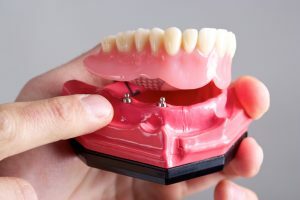 How Can I Get Implant Retained Dentures? To benefit from a permanent solution with implant retained dentures, you need a consultation with your Cambridge implant dentist. Dr. Lee will perform an initial consultation to ensure you are a candidate. In addition to evaluating your oral health, medical history, and lifestyle habits, CT images are taken to access your bone density. If you are a candidate, the images will be used for the implant placement process. The first phase of treatment involves surgically inserting the titanium posts into the jawbone. A few months after the implants are placed, healing caps are attached to the post through a minor surgery. A few weeks later, an arch of custom-made teeth are attached to complete your smile. With your new smile in place, you will care for your new dentures similarly to caring for your natural teeth. You will need to take extra care to clean around the implant posts to prevent infection, which could lead to implant failure. Where Can I Get Implant Retained Dentures? If you are ready to regain a complete smile with the most preferred solution, it is time to schedule a consultation with Dr. Lee. He will restore your smile and quality of life with an effective and predictable option.